This Summer we featured some of our favorite Tincrafts Cookie Cutters. What better way to cool down than with a couple of ice-cream cone cookies? Scroll over the photos to see some iced cookie samples. 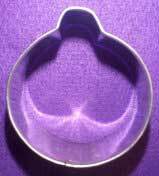 Our Cookie Cutters are made from ( ) gauge tin, a better thickness for a cookie cutter. The top edges are rolled and finished to protect young hands. Each cutter is finished with a high gleam, pretty enough to leave out on the counter. 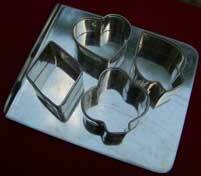 Our Gift Set of Pint-Sized Cookie Cutters & Baking Tin are proving a big success. While the baking tray measures only 2 x 3 inches, it can go into the oven, just set it on top of mom's cookie tray..
After Thanksgiving, my mother turned her attention to Christmas cookies. Almond Crescents, Hermits, Walnut Refrigerator Cookies, Chocolate No-Bakes but most of all... Anise Cookies. You can find this wonderful recipe on the In the Kitchen page. Halloween and Thanksgiving are just around the corner, do you have enough Cookie Cutters? in every shape and size. 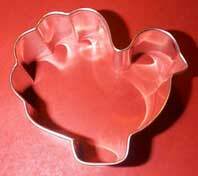 Take a look at our Christmas Cookie Cutters page. We have Christmas Stocking shaped cookie cutters and Gingerbread House and Gingerbread Family cookie cutters. Memory Ribbon Shaped Cookie Cutter.